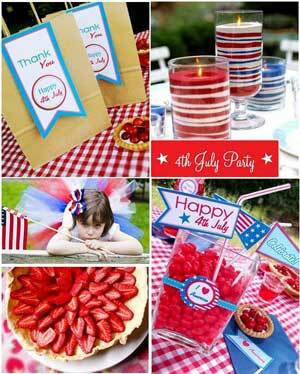 Top 4 Ways to Add Creativity and Fun to Your 4th of July Celebration Without Breaking the Bank! Ah, the temps are high and the living is easy. Summer has officially arrived and there is nothing like gathering up the family, catching rays, grilling and mingling over some refreshing summer eats and drinks. The celebration of our country's birthday is an American past time, but this year it comes with rising prices for some of your favorite summer fare. Luckily with some help from your friends at ImpulseSave, you can celebrate Independence Day with your family in style and with savings. This summer add some variety. Skip the pre-made platters to save on costs and make your salads ahead of time. To keep browning at bay, soak apple slices in lemon-lime soda for 10 minutes after cutting them. For a simple treat use candy that fits the red, white and blue color scheme, with your favorite candy from Red Hots to Swedish Fish, to gummy sharks! Set up a make-it-yourself cocktails and drink bar and buy the ingredients wholesale at Trader Joes or other discounted grocery stores. Create 3 hand written menus on paper or chalkboard to give your type A family members and guests a little guidance and help decorate the bar. Build a patriotic-themed photo booth! Simply hang a flag or sheet as a backdrop inside or out and decorate! Cheap accessories at the dollar store and spray paint are all you need to create a fun background. Don’t be outdone in the decor department and get the kids involved! Show off your family’s crafty side with these DIY decor ideas! Gather together your blue glassware from friends and fill them with red carnations for a quick, classy centerpiece. Create your own simple - and totally legal - homage to fireworks by punching holes in the shape of a star or other design in some recycled cans. Spray-paint them red, white, and blue and once you light a votive inside the can - instant home fireworks! 2 Responses to Top 4 Ways to Add Creativity and Fun to Your 4th of July Celebration Without Breaking the Bank!